USANA, word! : USANA Associate is Jumping to support JDRF! Are You In? Gabrielle Beaumont, one of our USANA Independent Associates from Norfolk Island, never stops chasing her dreams. 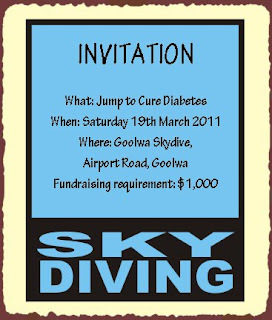 After successfully doubling the sales amount in just one month for her USANA business, she continues to push her limit jumping out of a perfectly good plane in South Australia next month and raise funds for JDRF (Juvenile Diabetes Research Foundation). The mission of JDRF is to find a cure for type I (or juvenile) diabetes and its complications through the support of medical research. As a Type I Diabetic herself, Gaby’s dream is a healthy world free from Diabetes! So she is committed to contribute as much as she can to make the dream come true. Gabrielle has set up a fund raising web page and her goal is to raise $5,000 by getting 5,000 people to donate a $1 each. On the day of skydiving, Gaby is going to take her favourite USANA Rev3, so she is pumped for this jump! Gaby’s another “secret” mission is to educate people about healthy energy options and share the REVolution with her peers. She reckons with its cleaner, smarter, and stronger benefits, Rev3 is a great alternative to those normal crash-and-burn energy drinks. This venture is open to public, so if you want to jump with her, put your hands up!